From my present perch of experience and years I sometimes think about the early days of my flying career and I have to say I often give myself goose bumps with the recollecting. Casting my thoughts back and reliving some the dumb things I routinely did with airplanes in those halcyon days, I wonder how I could have gotten away with it. I shouldn't have, you know. One of the things that give me shivers is recalling the airports that we were flying from during this period. I wonder what in the world I was thinking when I flew the airplanes that I did from the short grass strip that was our runway at Lewis field where we ran the flying school. The strip was 1,600 feet long, with the ends stoutly defined by fence posts and barbed wire, so there were never negotiations available about the boundaries when summer pushed the density altitude up. In the beginning of our flying there, the field suited the Cubs and Champs that we were using just fine, because those airplanes were after all, what the airport had been built for in the forties. But as time went by and the operation grew, more modern aircraft started calling the field home and it became less and less an appropriate airport. A Cherokee Six was added to our fleet and a Comanche 250 was purchased by one of my students and I was soon routinely flying them both from the postage stamp we called our home airport. Standard procedures for the Six and the Comanche called for a powered approach with full flaps at a speed that was slightly on the back side of the power curve. Once the fence was cleared the power was cut, the aircraft was flared smartly and the flaps were simultaneously milked up to minimize float. I can't remember if I ever learned to do this while chewing gum, but I wouldn't want to try doing it now even without the gum. Winter brought a whole new set of problems associated with operating airplanes from an unpaved strip. While our West Virginia winters are usually not severe in terms of snow fall, they are gray and wet, and in winter our runway turned soggy. Takeoffs became algebraic computations in figuring angles and paths between mud holes where the airplane would become bogged down. On several occasions I manned the controls while an erstwhile student pushed on a strut and I blasted the throttle to extract us from the clutches of the mud and get the airplane to a high spot from where we could start the takeoff run. During one takeoff in the Comanche, I hit a soft spot just where it was too late to stop. With the fence looming in my windshield I had no choice but to haul on the yoke and try to leap the fence. The airplane staggered into the air, the gear missing the fence by inches, then settled to earth in the adjoining cornfield where it trundled along lightly on one wheel amid the harvested corn stubble for twenty yards or so, then became airborne again, bless its stout heart. One February did bring a significant snowfall that did not soon go away. The field remained covered with the white pack to a depth that even the Cub couldn't navigate, so we were grounded, and unfortunately a sod field cannot be plowed without destroying the turf. Day after day I had to turn down student's request to fly while the snow remained stubbornly in place. Finally, with the threat of starvation looming, I ordered a set of used skis that I found advertised in Trade-A-Plane. I picked up the skis at the bus station where they had been shipped and spent several hours figuring out how they mounted to the airplane. Although I had seen pictures of airplanes mounted on skis, I had never actually seen one in person. After much head scratching it seemed to me that I had them mounted correctly at last, and I walked the airplane out of the hangar into the deep snow. I fired the Continental up, the first airplane noise the airport had seen in days, and let it warm. Then I blasted free of the snow in a smoky swirl of white. What fun. We kept the skis on for the month or so it took for the snow to leave during this exceptional winter and they did help me to keep myself fed. I flew students on the skis and a couple of them even made their solo flights from skis instead of wheels. I found that just about any open field with clear approaches and 300 or so feet of ground could be an airport for the Cub on skis, and I spent the month dropping in on friends living in places where it would never occur to anyone that you could land an airplane. 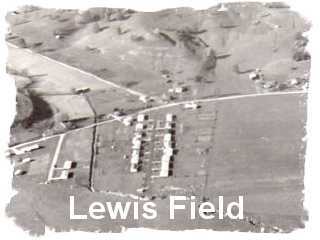 I had a large number of students in Grafton, a town twenty or so miles to the north of Lewis Field and I had started taking the airplane to the grass field there on a Saturday twice a month or so, to fly all the students from that area. During the period the Cub was on skis I flew up to the town one Friday night in order to start bright and early on Saturday morning, since I had several students scheduled. That night I stayed at the farm house with my friend who owned the airport and the temperature fell to near zero. The next morning, after a half mile trudge through the snow to the airplane, it refused to start and even more discouragingly, it refused to fire even once. After propping the engine until my arms were ready to fall off, I decided the plugs were frosted and that I needed to remove them and heat them up. Back to the farmhouse for tools I went, logging another half mile slog through the snow, then back again to the airplane where I removed the plugs. One more time I made the ever longer half mile to the farmhouse where I baked the plugs in the oven for a half hour. After dragging me and the now toasty spark plugs back to the airplane and installing them, the airplane started on the first pull. I was exhausted before flying with my first student. 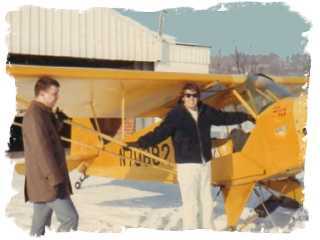 Another flight in the ski equipped Cub that stands out in my memory was a trip to bring fracturing explosives from Ohio for a local gas drilling company that had used me several times for transport. Bad roads had made it difficult to send a truck for the devices, so I took the Cub and flew to Ohio to pick them up. 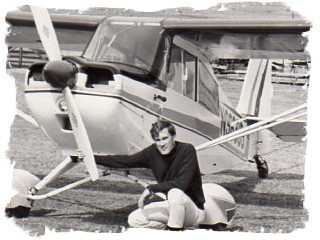 I returned to Buckhannon slightly after sunset, fat with 150 lbs of high explosives tied down in the front seat, ghosting over the Volkswagen that my very worried girlfriend used to light the end of the runway for my slightly illegal landing in the no electric Cub. Summer flying from unimproved strips had its problems too. One warm night I was returning late from a trip in the Citabria, which boasted an electric system and (gasp) a landing light. For some reason there was an abandoned washing machine (this just seems to happen in West Virginia. It's a cultural thing) that had ended up at the fence that marked the eastern edge of the landing area. In lieu of runway lights I would use the washing machine to identify the runway boundary as my landing light picked up its white form in the gloom. My usual procedure was to turn on the aircraft landing light and center myself in the valley where the airport lay and fly at 200 feet or so until the washing machine appeared in the beam of the light. Then I would pull the power and slide over the fence to a landing. On this particular evening ground fog had begun to settle in the dips and hollows of the land below me and I wondered if I would be able to find the runway. As I made my way up the valley through the misty air, the white of the washing machine appeared out of the gloaming and I breathed a sigh of relief. With the welcoming beacon in sight I had just pulled the power and begun my final descent to the runway when the washing machine began to amble off to the south. With a jolt I realized that I had homed in on a cow. An earlier summer night, when the Citabria was still new to me, along with such luxuries as an electrical system and landing lights, I had left Clarksburg late and as I flew towards home base I realized that ground fog had begun to form. Arriving over Lewis Field, I looked down and could still see the runway visible in the gloom below, although I realized I was seeing it through a thin layer of fog. Quickly flying downwind and turning a curving base to final to land to the west, I sunk down into the band of ground fog and the runway disappeared. Smugly reaching for the landing light switch, I flicked it on, ready for the powerful beam to dispel the fog. In the next instant I was suspended in what seemed to be a glass of milk. Everything outside my cockpit disappeared and I was totally blind, as if my windshield and windows were covered with cotton batting. Only the good reflexes of youth saved me as I shoved the throttle forward, turned the landing light off and tried to hold the airplane steady until I shot up out of the murk. Humbly and much wiser about ground fog and landing lights, I returned to Clarksburg where I spent the night. In addition to the difficulties that our home field presented, in an effort to make extra money for our always cash strapped operation we attended some of the area festivals in towns where there was an airport, or what passed for one, and gave passenger rides. We barnstormed as it were. A few of these airports were little more than meadows, and one weekend I recall using an actual pasture field as a landing area for the Cherokee Six on a mountainside above a town that was celebrating its annual fair. The field was long enough and not terribly rough, but with a slope that was reminiscent of aircraft doing glacier landings. This necessitated downhill takeoffs and uphill landings and this worked well until the tailwind upon landing exceeded 25 knots and the ground speed at touchdown got excessive; although with the tremendous slope it wasn't a long ground roll. Several times the takeoff had to be delayed until someone took a car and ran the sheep to the far end of the meadow. Probably though, the Ramp Festival in the high mountain town of Pickens was my favorite barnstorming gig. This celebration of the odoriferous member of the leek family hailed the vegetable that grew wild in the mountains of West Virginia and for hundreds of years has been a spring tonic for many mountaineers. Albeit and unfortunately a tonic that causes the partaker to emit an odor, from both breath and body that would make a maggot gag. The airstrip in Pickens was located between steep mountain peaks, in a valley so narrow there was room only for a row of houses, the road and the airstrip. During the landing patterns the wing tips would appear to brush the mountain slopes and the only aircraft I had that would handle the rugged approach and the rough unimproved strip was our Super Cruiser. I would fly it in early on a Saturday and stay busy all day, hopping riders until dark and then I would park the airplane and attend the square dance at the community center and spend the night in the little village at the home of a generous soul who would take in a tired pilot. Next morning I would taxi the airplane across the road to the Pure Oil filling station and fuel up with enough auto gas to get me back to Lewis Field, my students and my wonderful, crazy life, running a 1960's country flight school.